On September 17, Ken Burns and Lynn Novick’s highly anticipated 10-part documentary The Vietnam War will begin airing. In the meantime, brush up on your knowledge of the conflict on Fold3 with the more than 21 million records in our Vietnam War collection. 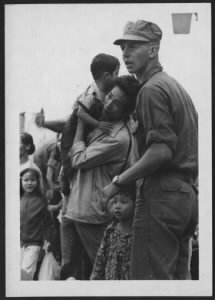 Photos: Fold3 has 4 Vietnam photo collections—Vietnam Marine Corps (B/W), Vietnam War Marine Corps, Vietnam War Army, and Vietnam War Navy. Many of the thousands of photos in these titles are in color, and they capture nearly every subject imaginable, from service members, to aircraft, to local Vietnamese, to military offensives, and beyond. Vietnam Service Awards: This title includes candidates for Meritorious Unit Commendations, Navy Unit Commendations, Presidential Unit Citations, Presidential Unit Commendations, Valorous Unit Awards, and Vietnam Unit Awards. Not only do the records in this title contain explanations and the history of each recommendation, but they also describe the missions, list the soldiers, and outline the process of approving or disapproving the award. Medal of Honor Recipients: Citations for Vietnam War Medal of Honor recipients are included in this title. The citations tell you when and where the Medal of Honor action occurred and typically give a fairly extensive description of the action and why it was considered deserving of a Medal of Honor. The Vietnam War medal citations begin on page 799 of the first volume (1863-1978). There are also a few Vietnam-era citations in the second volume (1979-2013), beginning on page 28. The Pentagon Papers: This formerly top-secret report was originally leaked to the New York Times in 1971 and revealed damaging insights into U.S. policy in Vietnam, creating a whirlwind of controversy. In 2011, the full 7,000-page report was declassified and released to the public. Interactive Vietnam Veterans Memorial: The interactive memorial on Fold3 was made of 6,301 photographs of the Vietnam Veterans Memorial in Washington DC that were stitched together by computer into a single, high-quality image. The Interactive Vietnam Veterans Memorial allows you to either search for a name or look at a high-resolution image of the wall—as if you were really in Washington DC. Every name on Fold3’s Vietnam Wall is connected to an Honor Wall page for the veteran that you can view or edit. Search or browse these Vietnam War titles and more on Fold3! I have many pictures from the Vietnam war and a couple of newspaper clippings from when my father Lyle Allen Parker served. Years of service were from 1967 to 1971. I would love to share. What a generous offer. I hope you find someone to help you. I wrote to several soldiers in Vietnam through the USO. I still have about fifty-five letters that I received. You can make a page for any serviceman on Fold3. You should add them there. Thank you Janice Haefeli, I will do that. My late husband has donated many memorabilia of his tour of duty 1969-70,in USMC to the USI library. One of the many items is his personal scrap book. His name is Rickey L. Winters. I am a Vietnam veteran. I served with HQ. Co., 8th Engineer Bn., 1st Cavalry Division…1965-66. I was a water purification specialist and was in support of the assault in the Ia Drang Valley in 1965. I don’t have any photos or memorabilia to donate except what I remember of my Vietnam experience. I look forward to hearing from the many who served, perhaps somebody who I knew when I was over there. Keep up the good work! Your memories of your Vietnam War experience are very important! If you’d like to share them, you can create a memorial page for yourself and share your experiences there. If you’d like my help with any of this, I’d be happy to assist any way I can. I would like to get any information on a convoy leaving long bihn to Saigon on Feb. 1968 during the tet offensive. I was in it during an ambush. I have no memory what ever happened. Up to this date I don’t even returning back to my camp. Sure would like to know what happen! I know a great deal about the Vietnam war. My husband and only brother graduated from West Point. My brother was killed in action during the Tet Offensive. My brother was a Dreadnaught tank commander. He was awarded the Silver Star posthumously. My husband was an engineer building roads, bridges and buildings. He came home. Found this on the internet. Not sure if it has anything to do with the convoy you were attached to. Just saw your message and wanted to help. My brother drove a crane at Danang and his rear view mirror was shot off. He was airborne engineers. Yes he came home in one piece physically. I am glad you said physically none of them came home with out some problem. No mater how long it took to show up. I have some films from Vietnam near Cam Ranh Bay 1966-67 I donated originals to Vietnam Center at Texas Tech University You can access my films under COL August W Smith If you have trouble locating them please let me know. Thanks for sharing, August. My uncle was in that area so I’ll mention this to him. 71st Special Operations Squadron 1968 to1969. AC-119G gunships “SHADOW”. Nha Trang and Phan Rang. Fold 3 what happened to the Air Force or are they like the Mexicans being left out by Ken Burns again ???????? The Royal Australian Navy Fleet Air Arm had a team comprising helicopter aircrew and maintenance personnel (8 pilots, 4 crewmen, 4 Operations officers and about 32 maintainers on 12 month rotation). The team was fully integrated with the 135th Assault Helicopter Company, call sign EMU Company, which formed late in 1967. The first CO was Lt Col Cory US Army and the senior RAN officer (LCDR) Neil Ralph was the XO. The RAN Helicopter Flight served in the 135th on year rotation until the Australian Government withdrew us in June 1971. I joined the Company in March 1968 as a replacement for LCDR Vickers who was killed by gunfire in February 1968. We were originally Anti Submarine helicopter crews. If only the country gave a damn about us then. When you came ack, in my case at Oakland Army Terminal. cheap clothing stores nearby did lots of business as people rushed to get out of the only clothing most had, a Class A uniform. If you looked for a job or tried to meet a girl, you tried to keep your service on the down low. Our GI Bill was a flat 225/mo. Started school in ’70, now.13 credits from a BA only ’cause I moved to Utah, which waives tuition for Purple Hearts, now cancer may well prevent prevent that. Our organization the “Marine Corps Vietnam Tankers Historical Foundation” is writing the history of “Marine Corps Tanks and Ontos in Vietnam”. The series will be a six-volume, by year, effort detailing our participation in the War. I was an Army nurse in 81st Evac Hospital Pleiku and 18th Surg Hospital Quang Tri in 1970. Not many records were kept for females in Vietnam or their service units, histories, etc. Would be nice to find some of those. There is a book entitled “Women Vietnam Veterans” . The author is Donna Lowery and the publisher is Author House. It was published in 2015. It compiles information about women who served in Vietnam from all branches. It is limited to those women who served in positions other than nursing. I served as a civilian working at the USO in Qui Nhon from 1969-1971. I have written about that experience in a memoir, Friendships and Kindness in the Midst of War. It is now available on Amazon in paperback under Bette Newton Gregory. There may be pictures you find familiar and since we were located on the airfield you may have visited our USO. We served about 1,200 people daily. We also made helicopter visits to units in the field. I would love to hear from anyone who is interested in sharing experiences. Watching the Ken Burns special is bringing it all back. I couldn’t have watched it if I hadn’t written the book even though most of my experiences, unlike most, were meaningful and heartwarming. Best Wishes. I was at the Air Force Base in Phan Rang 1967-1968, and traveled to several other in-country airbases. I apparently was affected by Agent Orange and my Daughter, thru birth, was also affected. It took Our Government a long long time to admit responsibility. Other veterans should be aware of the impacts of Agent Orange and make claims to the VA. I would enjoy hearing from long lost friends. Is there anyone out there interested in writing a book about the unspoken “Agent Orange” casualties of the war. My father served in Da nang Viet Nam in 1965. He was injured by mortal fire,. May I get his purple heart and official marine corps photos for my brothers and I and his grands? How would I get this? Got misplaced over the years? Name Eli Jones Jr. Contact the National Personnel Records Center, 1-314-801-0800. This office is part of United States Archives and stores hundred of millions, possibly billions of documents of all kinds including military service records Access the internet for more information. On May 13, 1968 the 126th Supply and Service Company (DS) of the Illinois National Guard was sworn into service. The unit served at Chu Lai as part of 1st Log Corps until August, 1969, when it was released back to the ILARNG. Not only did the unit serve and receive a Meritorious Unit Citation, individual members who had been declared “surplus” served from Germany to the Korean DMZ to a chemical warfare exercise in Alberta, Canada. If you’d like to contact the unit, please email me…both my brother and I were in it. I knew a couple of guys in other units who went from Germany to Vietnam. Interesting information about your group. During the Viet Nam War, I joined the Navy and met a pretty WM (woman Marine). We were engaged and I met her brother who was one of the Walking Dead (9th Marine Division). He was one of the (if memory serves me correctly) 200 who walked out of the Drang Valley. This was in 1965, again memory gets foggy at times. I wrote letters through the USO to several men in Vietnam who didn’t receive much mail. A couple of them had similar experiences with their girlfriends and I was just a friendly reminder that they weren’t forgotten. Waiting everyday for a letter than never comes is difficult. One guy was also a “Doc” and his letters were interesting, entertaining, challenging, and fun. He obviously was very smart and a little crabby sometimes. I still have his letters from 1970. Thanks for your service and for sharing your story. I was in the Air Force, and served two tours in Nam. First one at Cam Ron Bay and second at Phu Cat, 1969 – 1971. I believe my first daughter, born in 1978 has birth defect issues caused by my exposure to Agent Orange. Her lungs were not completely formed, and later on she developed vein problems in her leg and joint problems. I have brought this up to the VA but they are disavowing any connection. Any suggestions on how I can pursue this? Chance: Phu Cat AB and at the time I was there, 1968-69 home of the 37th Tactical Fighter Wing, Iowa Air National Guard and other assorted units. Korean Tiger units on the wire, at least most of it. RED HORSE built in 1966, ovefr run by th NeVA in 1972.. From personal knowledge I know a little about Agent Ortnge. 100% disabled Veteran. I would start by reading as many articles by Tom Phipott, a national military correspondent and author. The VA does what it can but what you need is a knowledgeable advocate who can work on your behalf. Benn there, done that! My brother was a Vietnam vet, now deceased due to agent Orange, he was a retired Lt Col.
Leslie. My condolences for your loss. I’ve also lost many friends and acquaintances to Agent Orange. Some of them or their families never knew what they really died from. Tragic. After 50 years of wondering if I left a child in Vietnam I found a web site for children and fathers searching for each other. Within six months my ex-girlfriend was located and I know now that she lost the baby. I suffered a lot of pain and anguish during those years as I learned how Amerasian children and their mothers were treated. To Beverly Huy, Chance Hall and other Vets from Nam. Veterans from Vietnam, you may possibly be entitled to compensation due to exposure to Agent Orange!! There is a very long list of possible conditions caused by it. The entire country and water was covered with it. The VA has finally acknowledged responsibility and you should make your claim if necessary. It takes a long time but it may be worth your effort. Apparently the only way we the Vet finds out about this is from other Vets. Herman, Thomas, and all my fellow Vietnam vets. I’m very sorry to hear about your daughters and any other vets that have been affected by agent orange. A few years after I returned from my last tour, I met my wife and we got Married. After we got pregnant my wife had to be put in the hospital for the last few weeks of the pregnancy. They had to take our daughter early so she was premature. After rushing her to a children’s hospital by ambulance things finally looking better. Didn’t find out until later that her premature delivery and other issues may have been caused by my agent orange exposure. I didn’t have a clue. my daughter was born in 1987, now the problem is that she started having trouble with her vocal cord became paralyzed, they did a scoop to find that out. Now they have done a MRI and she will have a EKG. They say there is a problem with her heart that is a condition from birth. I don’t understand why it had not been found before this. She tried to get into the Navy just three years ago but was washed out after the first couple months,but not for that , she had a eye condition that was found, but why didn’t they find the heart problem with that physical. I know that the v.a. pays 100 percent to the child that has spinal bifida now. Your daughter sounds like she has done a lot with condition, you must be proud. My husband was an “Army Tunnel Rat”, spent most of his time near Cu Chi, he was there in 1965. Our son was born in 1970 w/a port wine birth mark on his face. Of course that “could NOT have been my husband’s exposure to that “Agent Orange” according to the great ” V.A.”. My husband was wounded 2xs while there, yet did not come home, just went back to the front line. I was just wondering if fold3 readers know anything about the Australian Navy Helicopter Flight Vietnam/135th Helicopter Company who served in Vietnam between 1967 and 1972. Bear Cat was one of their bases and on several occasions they supported the Seals unit. My husband served with this group 1969/1971. My name is Victor Battese. I was a pilot with the first RAN flight to join the 135th who were in Blackhorse in 1968. After I left, they moved to Bearcat. The 135th was a unique Company with a US Army CO and an RAN officer as XO. We were called the EMU’s. Allies couldn’t get any closer – we lived together, crewed helicopters together, (US Army leading the flight one day and RAN the next), our maintainers sweated and worked together to maintain/repair the helicopters,and we went through a bit of hell together. The term EMU came from Experimental Military Unit. The experiment worked. Proud to serve in that outfit. I still have some contact with some RAN members if you were wanting to trace someone. Fold3 won’t. Service records are maintained by the National Archives. There are also privacy issues. It’s also the law. The VA can help with obtaining service records. And the Veteran Service Officer can help also. I am looking for my Father’s records of when he was in the military. I think he was in the army not sure. I have seen pictures if him in a unifirm. My father passed awzy last yesr 11/04/2016. I miss him so much. He left me land in Sayre,Oklahoma. My aunt told me he left me nothing and she had him hand cuffed and brought to her houss 9 mths before he died. I do not know the reason or how she was able to get awsy with this but my father was drugged up after she brought him to her home all the time he told me he felt drugged up. She told him he had dementia. I did not see any signs of dementia except he did look drowsy and scared . My aunt would not let me take my father anywhere or let him out of her sight,which I thought was very mean and he did not kniw why he was moved from his home in mississippi and his phone that he had the same phone number for 15 years was taken away from him and 2 days after I asked my father to move in with me he died and my aunt was taking his social security checks and she would not give him any money. She had sold her part of the land that was left to her years ago but my father did not so I am his heir and my brother who is incarcerated. I have the deed to the land and I know there are oil wells on the land. The Indian Meridian River flows through the land and a Railroad track. I have filed an affidavit of heirship fir me and my brother and my 1/2 sister so not to be dishonest or greedy. I would like to know how to start recieving my oil and mineral rights and my fathers belongings that my aunt has stolen along with a woman my father was living with in Madison,Misdissippi. My father had an old rolls royce phantom that he used to get attention for his business as a salesman and minister. I don’t know how to receive my heirship fir being Cherokee or if there is a trust that the rights of the royalties are going into. Now I wonder if my aunt has claimed herself as heir illegally. I don’t have the money for an attorney and I still need closure on my fathers death. Who do I notify in the Cerokee nation to become a member so I can have my rights as true heir to my inheritence. My aunt was very sweet to me up until the last few months of my fathers death. She has dine nothing but lie to me and it was not her responsibility to take my fathers things nor make the decision to stop resesatation efforts. My father and I talked almost everyday on the phone until he was kidnapped from his home. I need to k ow if my aunt has tried to lay claim to my fathers half if the land. It was 120 acres my father left me 80. I assume my aunt sold the ither half. I have been collecting military insignia and uniforms since I was in high school. I am now 62 years old and am still looking for named Army, Marine, Air Force or Navy uniforms with their patches, insignia, decoration, and service ribbons such as the 4th Infantry Division, II Field Force, F-4 Phantom pilot, LRRP, etc. Information about the owner would be greatly appreciated as well. I am willing to pay for these items to complete my collection. After I am gone, my wife will donate my collection to the Library of Congress or the Army War College. Thank you! During the Vietnam/Korean Wars the public could send a telegram to the soldiers in abbreviated form from a predetermined list of numbered sentences that was available for perusal at the Post Office counter. Individuals simply addressed the telegram to the soldier and the text comprised numbers of the list of sentences e.g. 2 5 7 15. The message was then printed out when it arrived to its destination by the postal service.